It was a last-minute field goal that allowed Penn State to triumph over LSU in the Capital One Bowl on New Year’s Day. 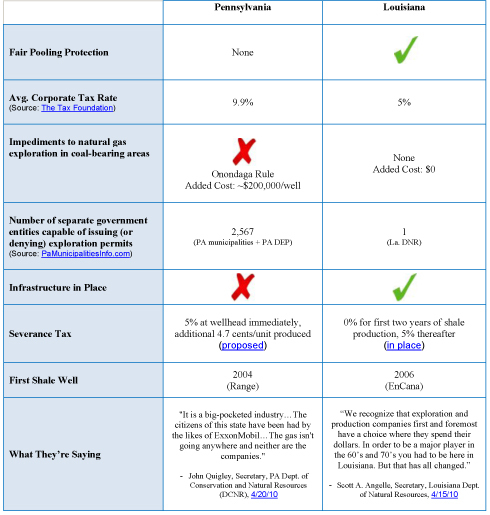 But it’s a combination of straightforward tax policies and a modernized regulatory framework that has allowed Louisiana to pull ahead of Pennsylvania in another capital-related competition – this one, in attracting the investment dollars needed to convert natural gas from shale into jobs and opportunity for its residents. Two charts below capture this emerging trend in sharper detail. 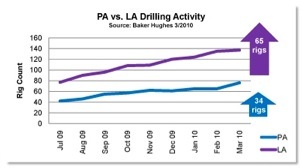 The first depicts the increase in shale gas exploration activities in Louisiana’s Haynesville Shale relative to Pennsylvania’s Marcellus Shale over the past 18 months. Why the huge difference? Well, for starters, in an environment where average natural gas prices are among the lowest they’ve been in decades, margins for producers tend to be at their tightest – providing a clear incentive for states to work in partnership with the industry to keep the jobs, revenue and affordable energy supplies coming. As this chart shows, Louisiana has decided to do precisely that – with great success. The chart below details how they did it. And more important: How we could as well.